Parents in the United Arab Emirates, when thinking about the education of their children, appear to be more career-minded than parents from other countries, a new survey shows. 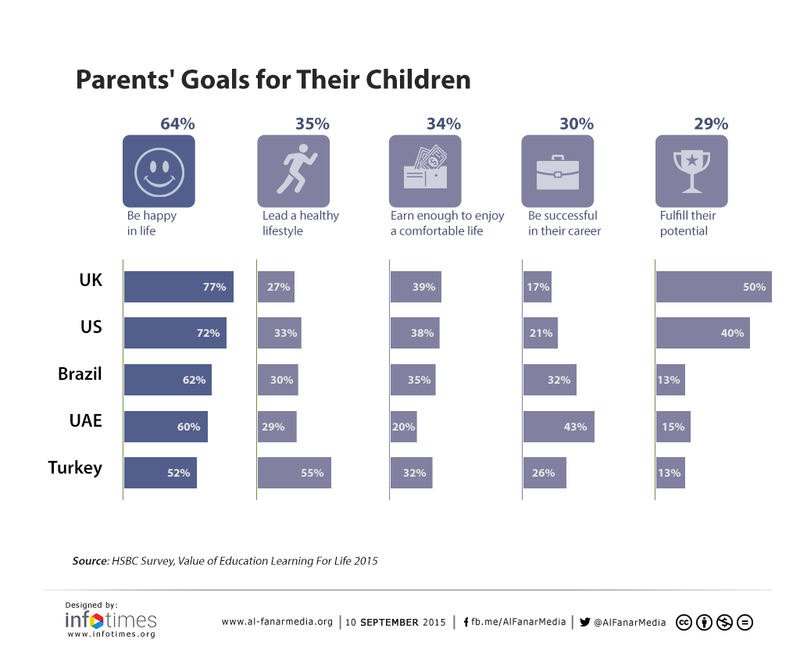 The survey, “Value of Education Learning For Life 2015,” was commissioned by HSBC and gathered the views of 5,500 parents in 16 different countries. The UAE, where 450 parents were interviewed, was the only Arab state included. To be included in the study, a participant needed to have at least one child younger than 23 and be at least partially responsible for making decisions about their child’s education. The survey was done in March and April. UAE-based parents had strong higher-education aspirations for their children. Ninety-two percent of UAE parents surveyed said an undergraduate degree is necessary for their child to get ahead in life, compared to an international average of 79 percent. The disparity is even more pronounced when talking about getting an additional degree. Eight out of ten UAE parents thought their child would need to get a master’s degree or higher—the international average for that question was just five out of ten. Parents in the United Kingdom, at 14 percent, were the least likely to say that a master’s or doctoral degree is required for success. The desire for a strong university education is a sentiment that Charlotte Seifi, a British expatriate living in Dubai and a mother of one, can sympathize with. “I would like my son to go to university,” she says, “I’ve already set up a savings account for him to do that.” She added that it seems most careers require a degree these days and if he turns out to be academically minded, she’d encourage her young son, Edward, to get an additional degree beyond an undergraduate one. Seifi knows better than most the importance of academic qualifications: She works in recruitment at a management consultancy firm. Seifi says that a qualification in the sciences, technology, and engineering fields is usually the most valuable in terms of career potential. So she will encourage any ambitions her son may turn out to have in those subjects. But she says she’d rather have him be happy in a career he enjoys. Most of UAE parents in the survey are of the same mind—60 percent of them list “be happy in life” as one of their three most important goals for their child to achieve as an adult. However, that’s noticeably lower than other countries. In France the number jumps to 86 percent, followed by Canada and the United Kingdom at 78 and 77 percent respectively. But many UAE parents, like Ms. Seifi, still focus on medicine, engineering, and computer sciences as preferential career paths for their children. A fondness for conventional professions may be a reaction to the current economic situation in the region. Unemployment in Arab countries is a longstanding issue, although admittedly much less so in countries like the UAE. But a separate report released in May of this year by the International Labour Organization cited issues such as declining oil prices and “difficult political transitions” as factors holding back economic growth in the region. The nature of the educational aspirations of UAE parents could be due to the socio-economic makeup of the Gulf country, says Natasha Ridge, the executive director of the Sheikh Saud bin Saqr Al Qasimi Foundation for Policy Research. The foundation works with and is funded by the Ras Al Khaimah government in the UAE to produce education policy papers. It also runs a career-advice program for Emirati national students before they go to university. “I think the demographics here are very skewed,” says Ridge. “In the UK or France you might be getting all kinds of parents, but here you’re getting a very middle-class cohort.” She explained that much of the UAE is made up of expats, such as Seifi, who are already educated and would naturally want the same for their children. “The Emiratis are also very credential minded,” she says. An explanation for UAE parents’ preference for science and engineering careers could be a lack of knowledge of what else is out there, says Ridge. “Careers advice isn’t good,” she says, “Most schools here may have careers advisors, but they’re often Arab expats who have come from limited career options themselves.” Ridge explained that most educational institutions don’t have the diagnostic tools to help students figure out how to put their strengths to use in the work place. Her foundation is running a program of aptitude tests for Emirati students aged 16 and 17. The results are discussed with the student and parents. The hope is that the discussions will broaden students’ career horizons before they apply for university. Almost half of all the parents surveyed in the study said they think their child’s generation faces a tougher job market than they did. Diversity in aspirations—making sure that every student isn’t competing to be a physician or an engineer—could help to ease the employment crush in the future.